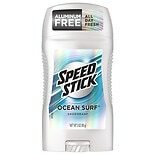 Shop Speed Stick by Mennen Deodorant Solid Ocean Surf (3 oz. )3 oz. 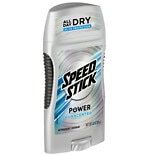 Shop Speed Stick by Mennen Power Antiperspirant & Deodorant Solid Unscented (3.25 oz. )3.25 oz. $299$2 and 99 cents$1.00 / oz. 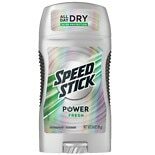 Shop Speed Stick by Mennen Power Antiperspirant & Deodorant Solid Powder Fresh (3.25 oz. )3.25 oz. 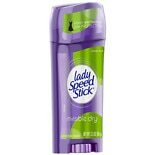 Shop Lady Speed Stick by Mennen Fresh Infusions Antiperspirant Deodorant Solid Wild Freesia (2.3 oz. )2.3 oz. $299$2 and 99 cents$1.30 / oz. 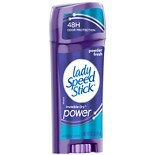 Shop Lady Speed Stick by Mennen Fresh Infusions Antiperspirant Deodorant Solid Powder Fresh (2.3 oz. )2.3 oz. 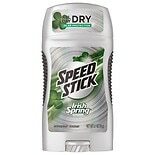 Shop Lady Speed Stick by Mennen Invisible Dry Antiperspirant & Deodorant Solid Shower Fresh (2.3 oz. )2.3 oz. 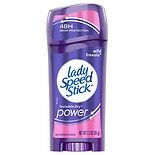 Shop Lady Speed Stick by Mennen Invisible Dry Antiperspirant & Deodorant Solid Powder Fresh (2.3 oz. )2.3 oz.